Hundreds of Palestinian prisoners held in Israeli prisons are currently on the 18th day of a hunger strike that began on 27 September, calling for better prisoner rights and improved incarceration conditions. The Palestinian Prisoners Movement first appeared on the heels of a 23 June decision by the Israeli government to remove many prisoner rights that were previously afforded, such as adequate food rations and the ability to obtain a college education from prison. Palestinian prisoners have also been subject to midnight raids on their cells and generally harsher treatment by their guards, according to video footage released in April and aired on Al Jazeera. Around 3500 Palestinian prisoners – from a total of 5374, many of whom are political prisoners – have decided to join the hunger strike for two days of each week. Although it appears to be a largely spontaneous, grassroots movement, some political groups have also embraced it. “The benefits and privileges enjoyed by terrorists in Israeli prisons will be revoked,” said Israeli Prime Minister Benjamin Netanyahu in June, after Hamas refused to allow the International Red Cross to visit kidnapped Israeli soldier Gilad Shalit. The Israeli government has yet to comment on whether or not it will reinstate these revoked benefits, especially in light of Shalit’s impending release as a result of a prisoner swap consummated with Hamas this week. The hunger strike’s main goals are to end the Israeli government’s policy of continuous solitary confinement, end random strip searches, and allow prisoners’ families to visit them in jail with fewer restrictions. Since June 2007, families of prisoners from the Gaza Strip are banned from all visits and around 1200 prisoners from the West Bank are also denied that privilege. “Israel has been acting like it is above the law; it breaks every international accord on both prisoner and human rights, and it is never held accountable,” says Palestinian Minister of Prisoner Affairs Issa Qaraqei. Qaraqei is in Egypt attempting to raise awareness about the plight of Palestinian prisoners and advocating action on the part of Arab and world leaders to try to pressure Israel to embrace the Geneva Conventions and improve prisoner treatment. The plight of Palestinian prisoners, he argues, is neglected in the international agenda. According to the Addameer Prisoner Support and Human Rights Association, instead of conforming with the Third or Fourth Geneva Conventions, Israel runs its prisons based on the “prison authority’s [own] regulations for security detainees,” Qaraqei says. “The whole world knows Gilad Shalit’s name, a low-ranking, young officer in the Israeli military. How many people know Samy Younis, an 85-year-old man incarcerated since 1983 [for participating in an attack that killed an Israeli soldier]?” Qaraqei asks. “The Arab media has especially failed in helping speak about the sometimes barbaric treatment of Palestinian prisoners,” he adds. Younis is one of 20 Palestinian prisoners currently suffering from cancer. One of the Palestinian Prisoners Movement’s demands is the release of inmates suffering from terminal and mental illnesses, as well as “administrative” detainees who have never been charged with a crime. About 285 of the Palestinians in Israeli jails are minors, according to the Palestinian Ministry of Prisoners Affairs. The ministry was not party to the negotiations that led to the release of 1027 Palestinian prisoners in exchange for Shalit, who has been incarcerated in Gaza. Hamas was the sole Palestinian negotiator, while the Egyptian mediation was believed to have played a strong role. “Hamas did not include us at any point of the negotiations over the past five years; still, we consider the deal to be a great feat,” Qaraqei says. His visit does not carry any official purpose vis-a-vis the swap, although the Ministry of Prisoners Affairs is technically responsible for the welfare and legal protection of all Palestinian prisoners. The prisoners to be released include members of all major Palestinian political factions, “although in differing proportions,” Qaraqei says. The Palestinian Prisoners Movement’s hunger strike is set to continue until the Israeli government agrees to its main demands, most of which date back to before Netanyahu’s statements last June. According to the Addameer association, after the 14th day of the strike, some Israeli jailers have decided to punish those striking, despite the deteriorating health of many of them, by imposing fines and withholding cigarettes and electrical appliances. For Qaraqei, this is a humanitarian issue that has yet to be addressed properly by the outside world. 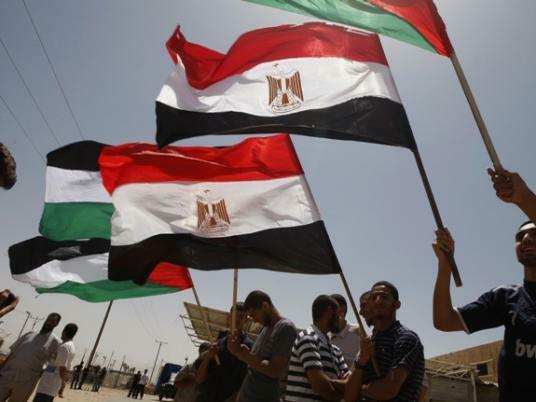 Palestinian prisoners’ hunger strike resonates worldwide | Al-Masry Al-Youm: Today’s News from Egypt.